I have always been amazed at animals that live in very cold water. I can’t stand it when my shower gets lukewarm, but animals like the Arctic octopus (genus Pareledone) flourish in waters that dip below 0 degrees Celsius! How can they do that? Well, they have specific characteristics that allow them to deal with the water’s cold temperature – characteristics that I obviously don’t have. But what is the basis of those characteristics? Until reading a recent paper by Sandra Garrett and Joshua J. C. Rosenthal, I would have said that the basis of those characteristics is the genome of the animal in question. As reasonable as that answer sounds, however, it is not correct, at least not in some cases. One of the most important things a cold-water animal must deal with is how the temperature affects certain proteins that govern the response of the nervous system. Cold temperatures tend to reduce the efficiency of those proteins. As a result, the colder the water, the slower the nervous system conducts signals. In very cold water, the slowdown would be so great that in the end, signals would not travel quickly enough to allow the animal to do what it must do in order to survive.1 Thus, it has always been assumed (reasonably so) that many nervous system proteins in cold-water animals are significantly different from the corresponding nervous system proteins of animals that do not frequent cold waters. Garrett and Rosenthal decided to determine just how different such proteins are by comparing the genes of an Arctic octopus (genus Pareledone) to that of a tropical octopus (Octopus vulgaris). 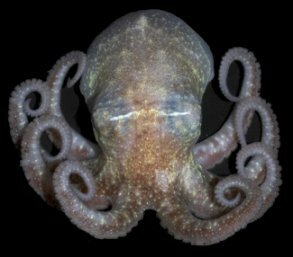 Since genes tell the octopuses’ cells how to make the proteins they need, the researchers assumed that whatever differences exist in the nervous system proteins would show up in the genes that produce those proteins. Once again, this is a completely reasonable assumption. However, their study shows that the genes involved in producing these nervous system proteins are nearly identical between the species.2 To confirm this, they injected the genes from the different species into frog egg cells, and they found that the frog egg cells used those genes to produce nearly identical proteins. So in the end, the genes that produce those nervous system proteins are essentially the same in both species. But that doesn’t make sense. The proteins have to be different. Well, it turns out they are different, but not because of the genes that produce them! To understand what the Arctic octopus does to make its proteins different from that of the tropical octopus, you need to remember that genes are essentially recipes for making proteins. They tell the cell what proteins to make and how to make them. They are found in DNA, which is mostly housed in the nucleus of the cell. However, that’s not where the cell produces proteins. Instead, the cell has little protein-making factories called ribosomes. The information in each gene, then, has to leave the nucleus and get to the ribosome, where it can be used to make the needed protein. To do this, the cell makes a “copy” of the information using RNA. That RNA copy is then carried to the ribosome, where another type of RNA uses it to build the protein that the gene is telling the cell to make. The way the Arctic octopus makes its nervous system protein different from that of the tropical octopus is to change the recipe of the protein, but not at the level of its gene. Instead, it edits the RNA! Somehow, the cells of the octopus “know” that the protein recipe in their genome will not produce a protein that can operate properly in cold water. Therefore they edit the recipe after it is taken from the DNA and before it is used to make the protein! As a result, the gene doesn’t change, but the protein that the gene produces does change, because the RNA that comes from the gene is edited. A clear advantage to this strategy is that it allows options: Different isoforms can be expressed in response to different conditions. In other words, this makes the animals more adaptable. If they end up moving to warmer waters, they can edit their proteins less. To confirm this idea, the authors studied a few more octopuses, each coming from regions with different water temperatures. They found that the amount of RNA editing correlated with the temperature of the water. Of course, how the octopuses do RNA editing and how they know how much of it to do is pretty much unknown. However, it is clear that RNA editing is yet another way the Creator has designed His creation to adapt to change. I expect as scientists study this more closely, they will find that it is fairly common throughout creation. That’s exactly the reaction I had, Josiah. My sister has been bugging me to check out your blog for months now and I’m glad I finally did! This post was fascinating! I am glad that you enjoyed it, Sarah! Wow… this is quite something. I’ll be keeping my eye out for this in future studies! Wow, I can just imagine the brain collecting all the temp. “data” from the skin cells and instantly sending this “update” through some type of biological “wifi” and updating ALL the cells info at once! This info being put into some “if/then” coding statements and wa-la! new realtime protein update! I’m sure it works nothing like that, but it’s fun to imagine! Dae, imagine the fun someone (or a group of someones) will have figuring out how it actually works! Thank you very much for the article. I enjoyed reading it. One thing I would like to know is how scientists such as Garrett and Rosenthal are able to determine and classify the different genes and proteins in a living creature. What kind of process do they use to do this? Good question, Enoch. The paper presents electropherograms, which means they used electrophoresis to sequence the DNA and RNA. They didn’t actually sequence the proteins, however, because they knew the gene sequence that produced them. They simply measured how the proteins produced by the frog egg cells reacted to voltage. Since they reacted in the same manner, that confirms they were essentially the same proteins. Thanks, Laramie! I hope your class finds it as interesting as you did!